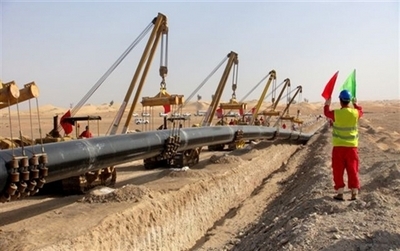 The Habshan-Fujairah oil pipeline under construction. 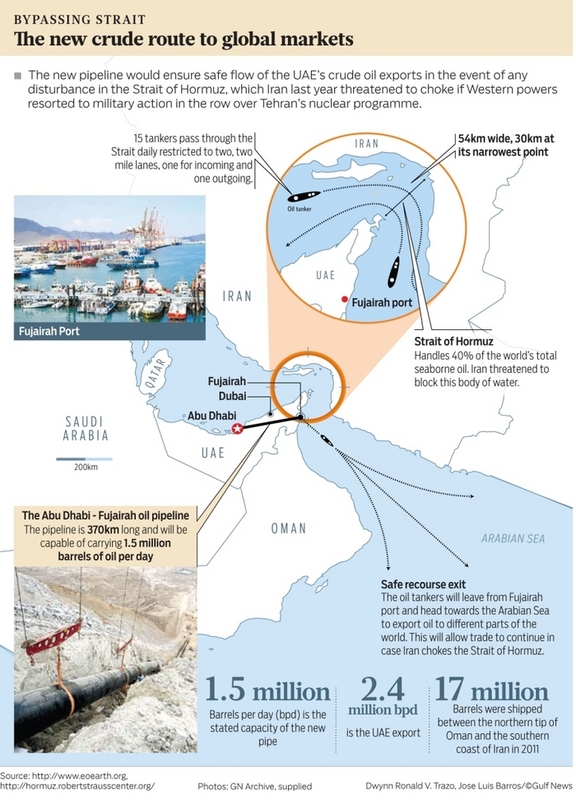 Abu Dhabi, one of the United Arab Emirates' seven member states, has prepared for the possibility of an Iranian closure of the Strait of Hormuz, the critical waterway through which about 17 percent of the world's energy passes; today marked the opening of the Habshan-Fujairah oil pipeline that carries its crude to another UAE state. Started in 2008, the 225-mile-long pipeline is four-feet in diameter, it cost about US$2.7 billion and it carries 600-700 thousand barrels per day with the goal of increasing that to 1.4 million or even 1.8 million barrels per day. Along with the pipeline, Abu Dhabi's government is building a US$3 billion, 200,000-barrel-a-day refinery at the pipeline's termination, Fujairah in the Gulf of Oman. June 29, 2012 update: The Saudi government has refurbished an old pipeline that carries 1.65-million barrels-a-day of oil Mu'ajjiz near Yanbu on the Red Sea. Built by the Iraqi government during the 1980s, the Iraqi Pipeline in Saudi Arabia (IPSA) has been mostly out of use since 1990. The Saudis confiscated it in 2001 to compensate for debts owed by Baghdad. At least two more projects connecting Saudi Arabia to Oman and Yemen are under consideration. Iraq also has an outlet, which is currently being expanded, to the port of Ceyhan in Turkey via the Kirkuk-Ceyhan pipeline. Should whatever regime replaces Syrian President Bashar al-Assad be interested, Iraq may also revive the Iraq-Syria pipeline as another means of shipping crude from southern fields to the Mediterranean. Much of Iran's current regional clout derives from its geographical location, but its antagonistic behavior is driving the country's neighbors and clients to seek ways to defuse this power and eliminate their dependence on the Strait of Hormuz. The effort to reduce Hormuz traffic presents the West with a new opportunity to augment its current Iran containment strategy while eliminating for good one of the biggest impediments to global energy security: a choke point that for decades has enabled rogue regional players to hold the world economy hostage. Comment: The Iranian leaders not only talk dumb but they act dumb.